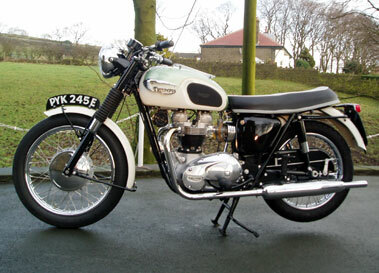 Triumph announced the TR5 Trophy in November 1948 at the Earls Court Show. 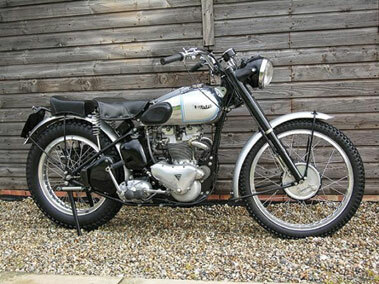 The new machine was intended for clubmen riders wishing to compete in off-road events and was based on the machines that the works team had successfully campaigned in trials and the 1948 ISDT. 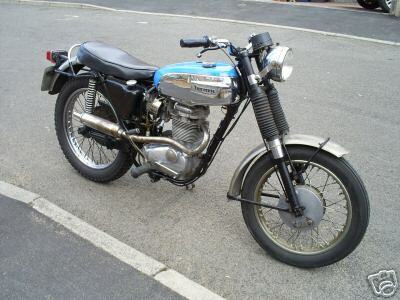 The 500cc engine featured a square alloy barrel taken from the wartime generator engine with early models retaining the cooling shroud bosses cast into the cylinder. 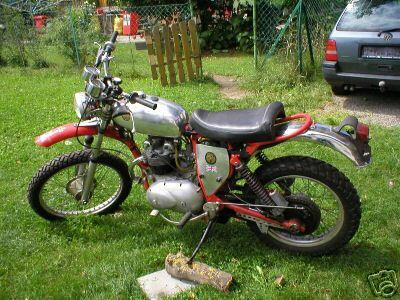 The engine and transmission were housed in a new, rigid, frame design which featured a shorter wheelbase than standard. 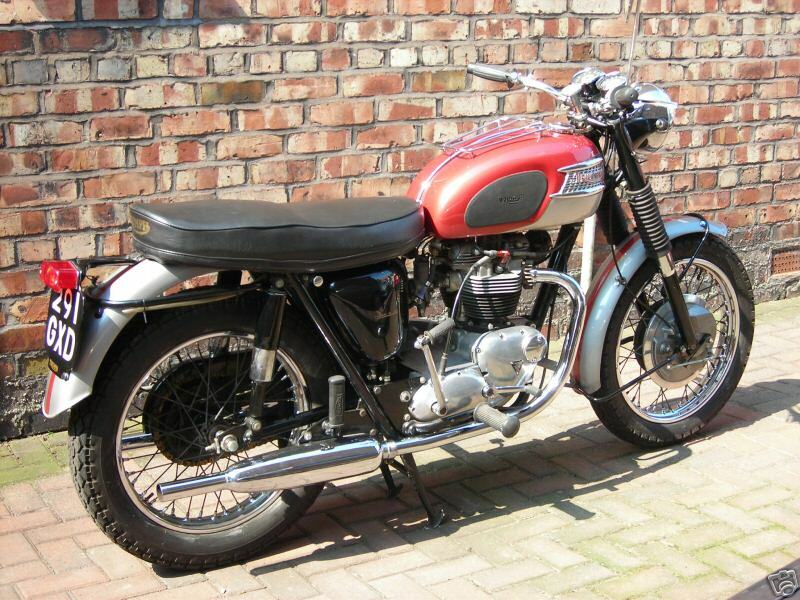 A high level, siamezed, exhaust system and a quickly detachable headlamp were fitted as standard and a range of parts were made available to enable the owner to tailor the machines performance to their chosen discipline. 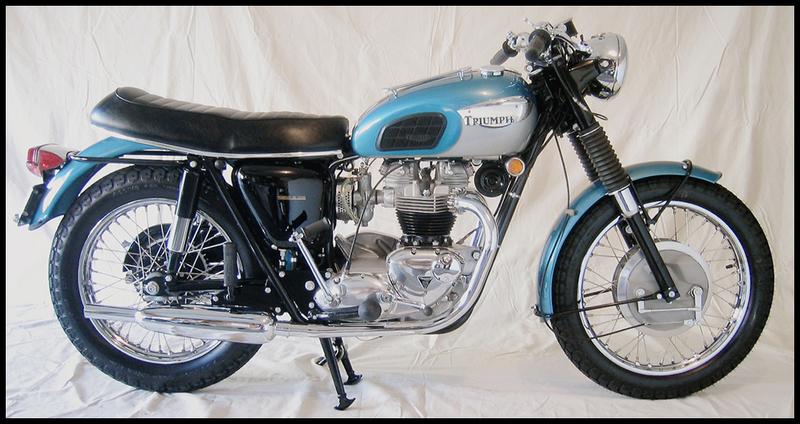 More Triumph Trophy information. 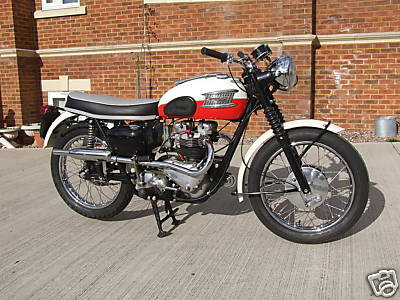 The 500cc TR5 Trophy not only had a sporting pedigree, it also had almost timeless good looks, which make it an elegant machine even today. 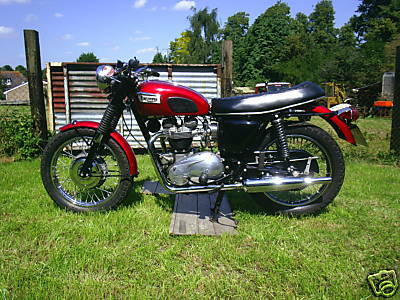 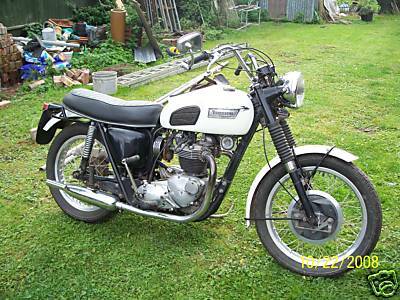 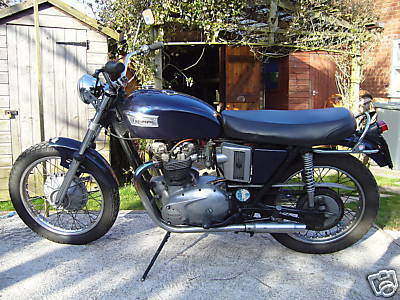 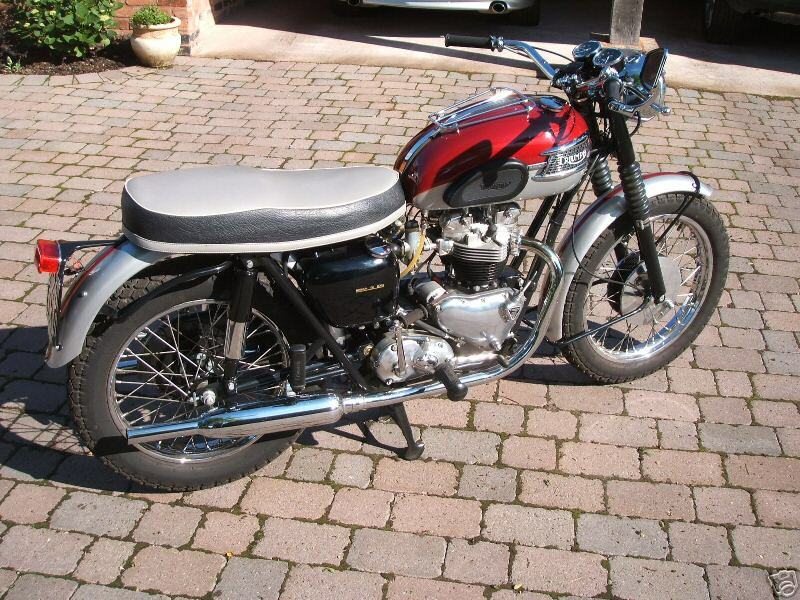 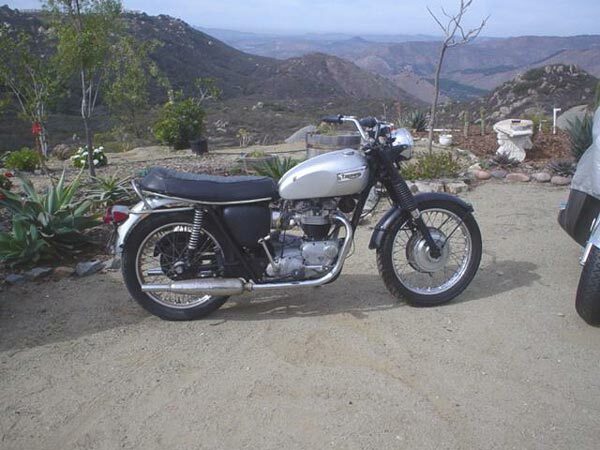 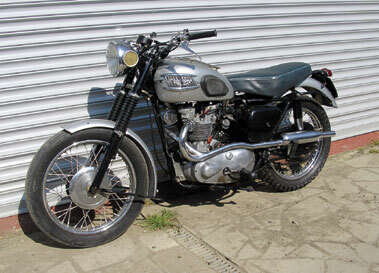 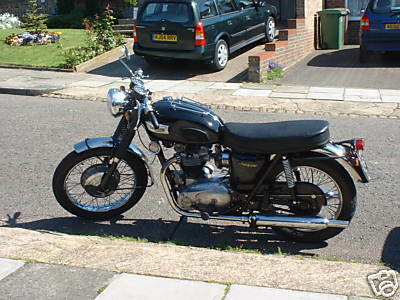 1962 Triumph Trophy TR6C Air cooled, four stroke, parallel twin cylinder, OHV. 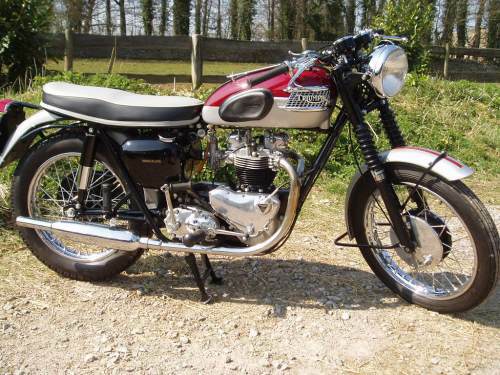 By the mid 1960's the Trophy had moved away from its original dual purpose role and had become a single carburettor version of the Bonneville offering virtually the same level of performance with a greater degree of flexibility. 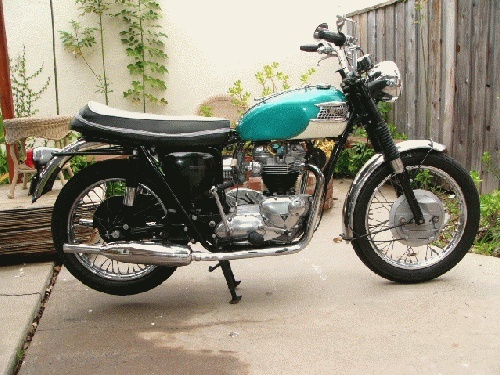 For 1967 the Trophy adopted the 9:1 compression pistons from the Bonneville bringing its performance even nearer to T120 and benefited from a new oil pump with greater scavenging capacity. 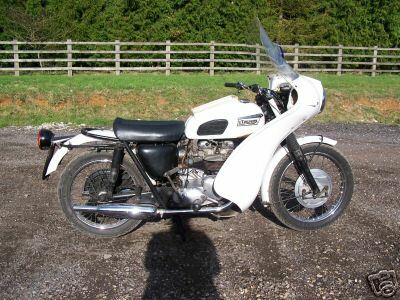 Modifications to the cycle parts were restricted to a new saddle and yoke mounted steering lock following the introduction of a new frame the previous year. 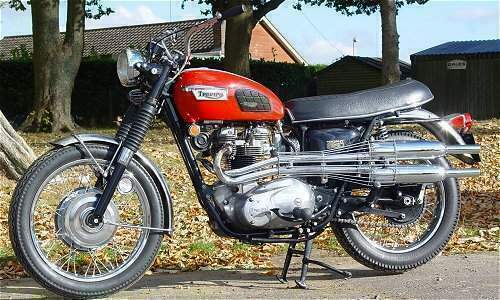 By 1969 model season the Trophy can justifiably be described as a single carburettor Bonneville, which is doing two excellent models a considerable injustice. 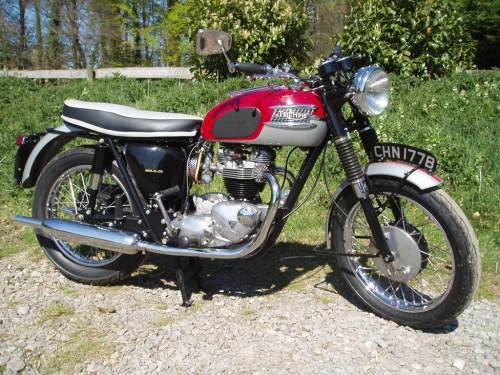 For those seeking outright performance the Bonnie reigned supreme, however for riders who wanted flexibility without sacrificing too much performance the Trophy with its single carburettor provided the answer. 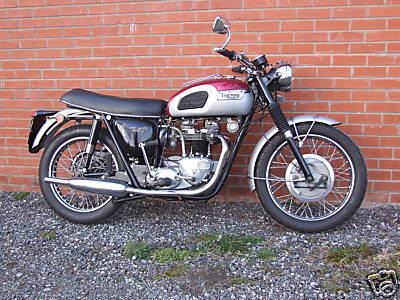 The 1970 season was the final year of production prior to the adoption of the oil in frame across the Triumph range, consequently changes to the models for that year were confined to detail improvements. 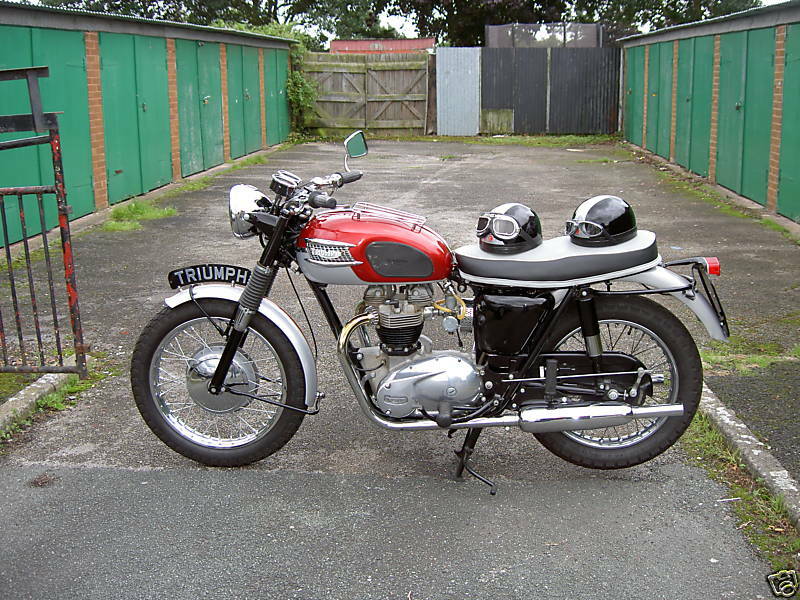 The Trophy continued to offer virtually the same performance as the Bonneville without the hassle of keeping two carburettors in tune. 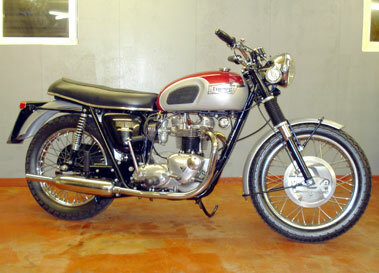 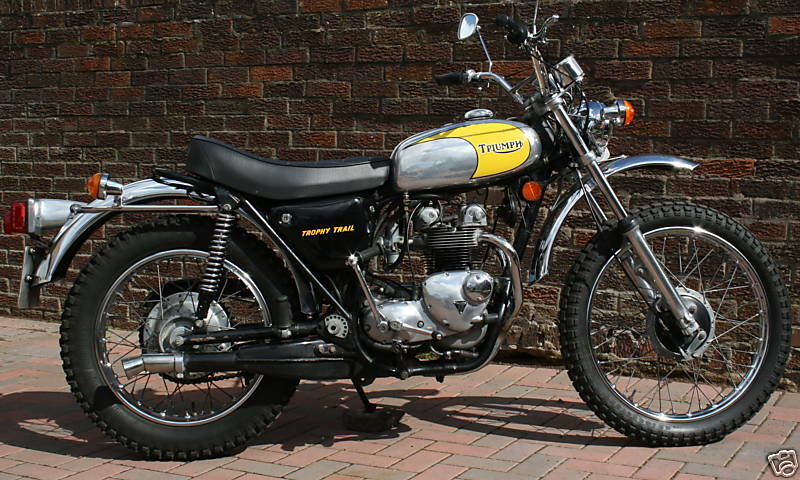 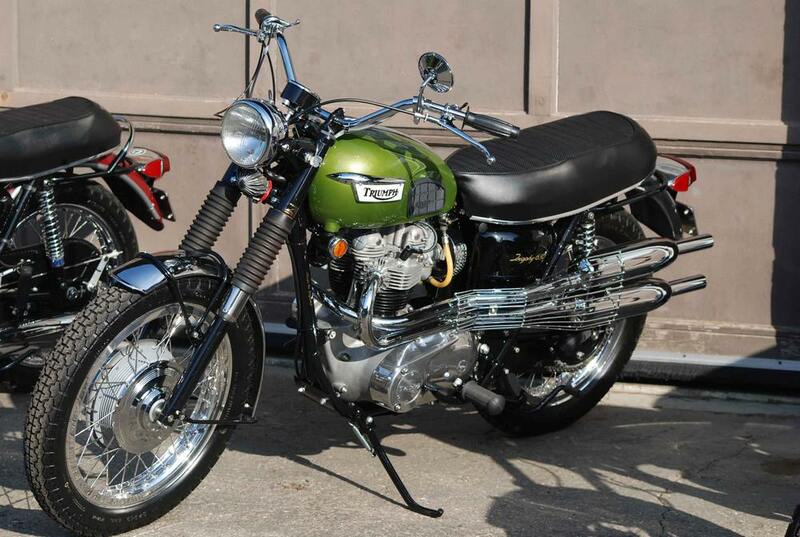 1970 Triumph TR6P 650cc Saint. 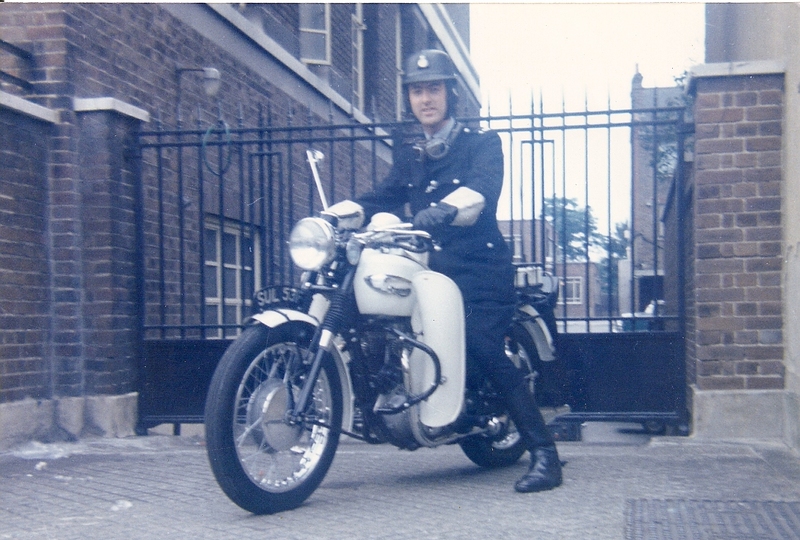 1972 Triumph Trophy TR6P 650cc ex-metropolitan police bike which came out of service in 1979. 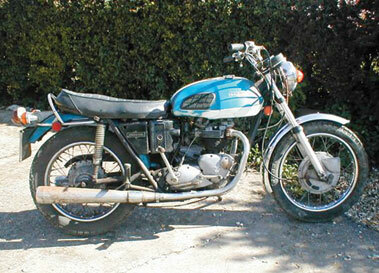 Triumph adopted a new oil bearing frame for the 1971 season with revised styling emanating from Umberslade Hall. 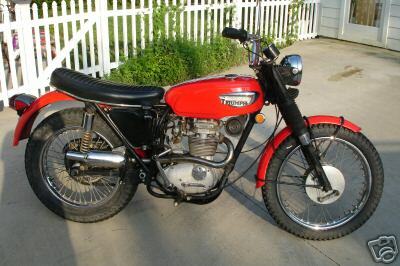 The new frame handled extremely well and was coupled to effective, if somewhat difficult to adjust brakes, the front being a twin leading shoe design. 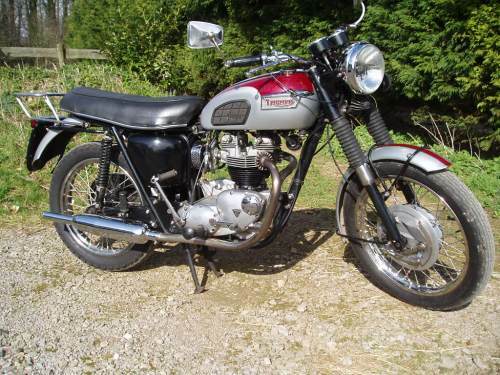 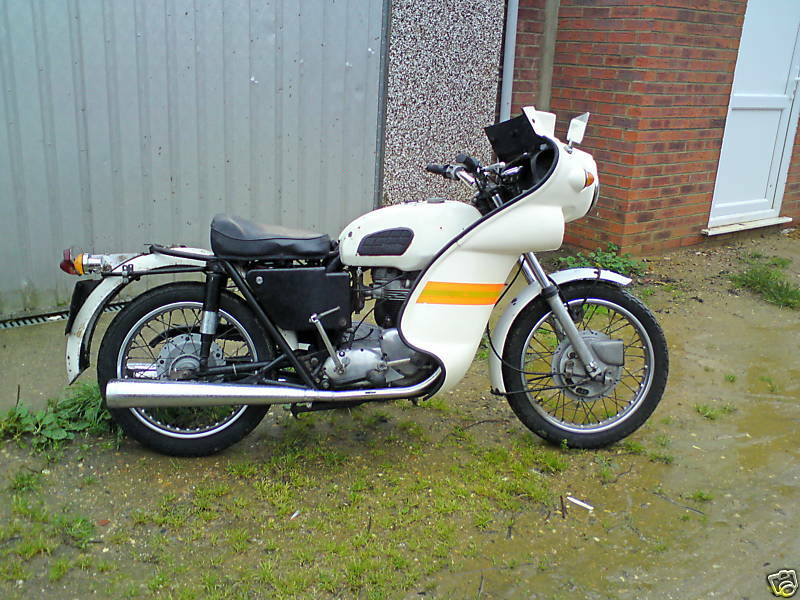 Slimline forks and short, blade type mudguards contributed to the sporty appearance of the machine.